Is Sage 50 still the right Product for me and my business? 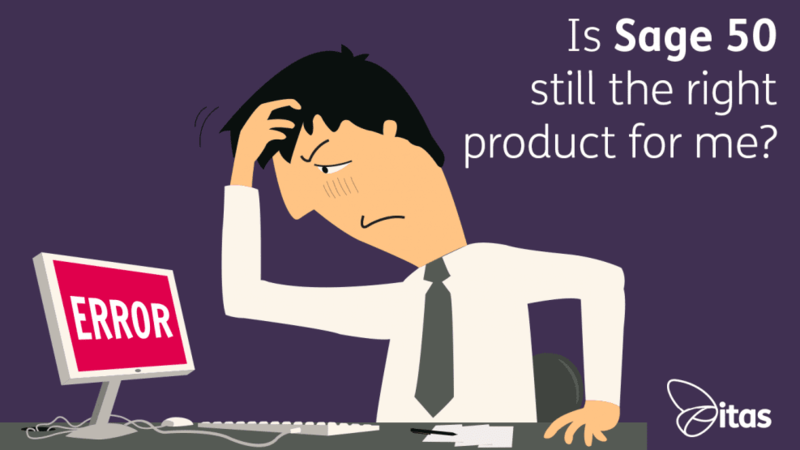 A question some of you may already be pondering “Is Sage 50 still the right product for me?”. Sage 50 keeps you ticking over, you’ve had it for years. Everyone is comfortable with it… But at what point do you move to a new system? Accounting systems are designed to cater to all different types of businesses, each system offers different functionality that may be useful for your business. What makes Sage 50 so great is that it can cover the majority of small businesses needs. It’s by far Sage’s most sold product. When you speak to an accountant and they mention ‘Sage’, 9 times out of 10 they will be talking about Sage Line 50. But as with any product, it’s only good when it fits your business needs. The issue people have is knowing when to move to something new. Even though Sage 50 has been so good for so long. To make things easier for you, I have created a questionnaire that has been designed to highlight key reasons for the change to alternative systems. We find when talking to businesses, many don’t understand how much time and money they are losing by sticking on a system that doesn’t meet their needs. Sage 50 has become part of the furniture, which can be a dangerous thing for the business. We still come across people still using DOS systems. Totally unaware of system developments, it can take one person’s whole job to send out invoices. In Sage 200, all your invoices can be sent out and automated at the click of a button. Just imagine the time and money a company like this is wasting. Think of what a new system could do for them. Okay, have a think about these questions. How long does it take you to process invoices? Sage 50 notoriously finds it difficult through times of growth, and invoicing is an important part of any business. This is one of the first things that takes a hit, you struggle to get invoices out in time. We find with lots of clients, the first thought would be to expand out their finance team. How about improving your processes with a new accounting system? Streamlining your processes with something like Sage 200 and following your Sales Order Process to point of invoice would help shave of processing time. With Sage Live (a cloud-based accounting product) and the Salesforce CRM integration, your accounts team can follow the sale from the first point of contact to invoicing. This helps minimise hand-over processes and gives your accounts team full visibility of the customer journey. Invoicing should never take you as long as a day or week, if you are currently in that bracket, please call us! There is an issue with your processes or the system you are using. How many people do you have doing the same job in the finance department? A big one for anyone going through a period of growth. If you are on Sage 50 and you have more than one person doing a single job, you need a review of your system. Sage 200 is designed to automate the processes you have in place in Sage 50. Before taking on someone who will simply be helping do another person’s job, look at Sage 200. You can get Sage 200 for the price of employing one person (there or there about) and after you have paid the initial payment, it will cost you around 2.5k every year. With a new employee, that big payment will be coming out every year; your business will be saving tens of thousands of pounds every year. How many people are there in the finance team? Similar to the question above, how many people should be on sage 50 before you switch to a new system? Anything more than two, you should be looking at a new system. The more people you are employing to do a job that could be automated in another product is more money you’re losing. How many companies do you have? On Sage 50, the system doesn’t cater very well for a business with more than one company. You have to pay for every extra company you have, the reality is, Sage 50 isn’t designed to have anything other than one company. If you are on Sage 50 and have more than one, you are already pushing Sage 50 to its limits and you need to look for ways of improving your processes. A start will be looking at either Sage Live or Sage 200. Both systems are multi-company and are designed to handle more than one. Give us a call if you fit in this bracket, you could be losing money. Do you use foreign currency? For any kind of foreign currency transactions, take a look at the capabilities of Sage Live and Sage 200. Would you like better reporting? I’m not sure how my reporting can be improved? For a lot of businesses, better reporting will be high on the wish list. With Sage 50, reporting can be limited. The small 2 tier nominal can restrict the depth of your reporting, especially if your group is expanding. A bigger system like Sage 200 will allow you more in-depth reporting, consisting of the 3 tier nominal structure. However, if the jump to Sage 200 is too big, you could also look at itas’ very own i50 connector for Power Bi. With i50 your business will be able to access live, real-time reporting from Sage 50. Your business could utilise the use of dashboards, which we have found particularly useful for sales teams and warehouse management. Are you still using Excel sheets? One of the most surprising discoveries I have found is the number of companies still working on masses of spreadsheets. Excel is the definition of manual processing, if your business is still using Excel then one of the first things to consider is moving it onto an automated accounting system. Most recently we have moved a business managing stock entirely on Excel to Sage 200 with commercials. The margin for error and the amount of time being wasted on Excel can all be greatly reduced with a system like Sage 200. With the addition of ISV’s like Sicon, you can almost make the system bespoke to your business requirements. Has that made you think? Still not too sure? Hopefully, the questionnaire has made you more aware of reasons to change, some of them you may not have even realised could be reasons for a change. Highlighting the pains you have with a system sometimes isn’t a big enough driver to move onto something new. You may not have the budget there for a system like Sage 200, for lots of businesses this can be most significant. It can be difficult to justify paying a significant amount of money for a new system when Sage 50 is so cheap in comparison. The reality is, the higher up the software tree you go, the more and more bespoke they will become. Sage 50 is an out of box system, with only limited configuration. Sage 200, Sage Live and other systems take lots of man hours to get right. The final result is a system that works for hand in hand with your business. What’s the first thing that scares you? It’s the price, but let’s break it down. When growing your business, your first thought would be expanding your team. Already, you have looked past your accounting software. When expanding you want to make sure you have the facilities for growth, the manpower, and relevant infrastructure in place. Here’s a question, how many employees would it take to sustain growth in your financial department? Is it one, or two? The answer should be, potentially none? The whole point of investing your money into an accounting system is to minimise time spent on nonvalue-added tasks, save money and have better visibility of your business. The difficult thing for decision makers is quantifying that Return on Investment. Moving to a new system can seem like a lot of money but when you think about it, it can be justified. On average I’d say an implementation project costs 20k to 25k… Wow, expensive? But, how much would it cost you to employ a new accounts executive? All that time you are spending on manual input into the system alongside the increased workload for your accounts team, it’s one or the other. So, let’s break it down. Average Sage 200 System – Payment Upfront 20k + Ongoing 2.5k every year for licensing & Support. Now, for this example let’s say an Accounts Assistant doing mostly manual input, sending invoices for example. I can’t afford that upfront! With a system like Sage 200, the processes currently manual in Sage 50, will be automated. The system will give you enough room for growth, also your accounts team will have more time to input in other areas of the business. The jump to Sage 200 can be too big for some people though, maybe it’s 6-12 months too early. The other option you have is looking improving your Sage 50. If you’re looking for better visibility, take a look further into our i50 Connector and see how you can transform your business. Your best option if you are struggling to make a decision or are unsure of your next steps, just talk to a partner. We will give you the best advice on business solutions and help you make the right decision on what your business needs. Home » Sage Blog » All Sage Blog Posts » Is Sage 50 still the right product for me?